The August Smart Lock uses keyless technology to keep your home safe no matter where you are. From your smartphone, you can let guests in, check to make sure you locked up before you left, keep a record of who has entered and exited, and unlock your door from the driveway. Cost? About $220. You can ease into wireless control of your lighting and appliances with Insteon’s Start Here Kit, about $125, before moving on to automating other household needs, like irrigation control and occupancy sensing. The WaterPebble Water Saver memorizes the length of your first shower and uses it as a benchmark to measure future shower times. Using a series of ‘traffic lights,’ it reduces your shower time by a fraction each time, helping you save on your water bill without trying. About $12. For about $250, the Nest programmable thermostat will learn your heating and cooling schedule and program itself. 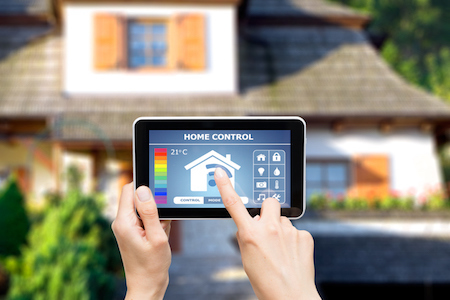 It can even be controlled from your phone and could save you up to 20 percent on energy costs. Is your sprinkling system over-watering or under-watering your lawn? Toro’s wireless Xtra Smart Soil Moisture Sensor keeps the moisture level just right. Not only will the health of you lawn improve, but your wallet (and the Earth) will benefit, too. About $115.